Spring is officially here and we are ready to celebrate by refreshing our favorite spaces! Clean, airy design can bring a fresh look to any room of your house for the warmer months to come. 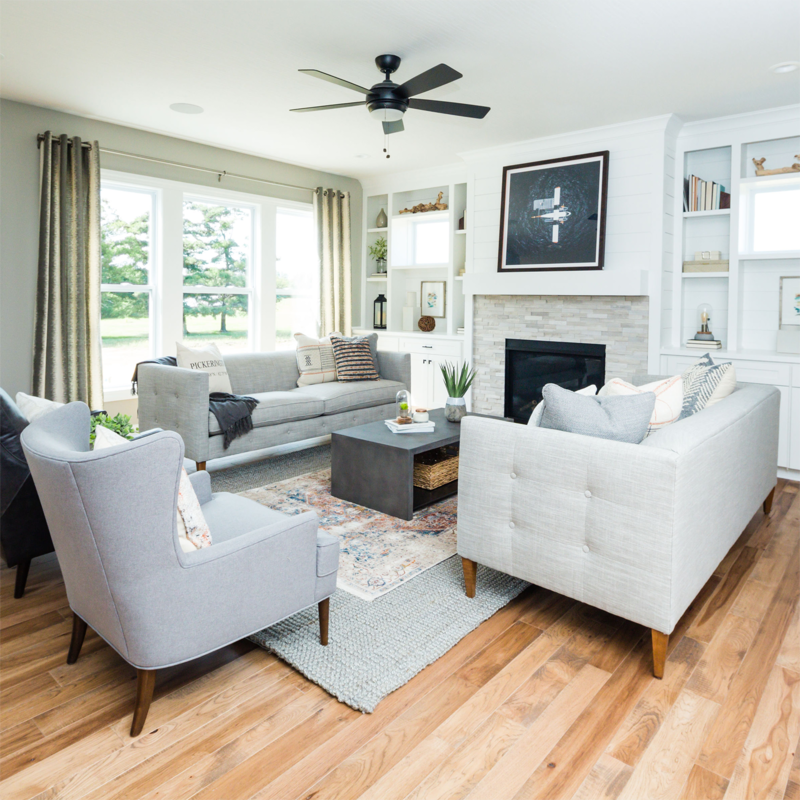 One of our good friends and talented designers, Susan Campbell, designed this Donley Homes model home with a goal to bring a refreshing look to your basic rooms. In this formal dining room, a large farm table takes center stage and allows plenty of room for you to fit more of your favorite people around the table for dinner. Don't be afraid to mix it up by varying styles of chairs to bring dimension and character to your dining space! The soft grey Twill dining chairs add a relaxing touch to a more sophisticated setting. A detailed navy and cream rug adds a lighter touch and opens up the room. We would be eager to sit down for a meal here! Say goodbye to the boring home office where all of your unwanted papers get thrown. Warm up your workspace with a pop of color by adding a large area rug with rich shades of blue. The iron Grisham desk adds an industrial edge that elevates the look without overcrowding the space. We love how the designer kept it simple and neutral with the Brando chairs in a light linen fabric. This clean, airy kitchen design is accented by the Nice counter stools in a dark moon fabric. The stonewashed fabric pulls out the slate gray backsplash and complements the clean, white lines of the cabinetry. These stools are the perfect addition to welcome guests in and make them feel at home. The aerial Sea Plane artwork definitely steals your attention as you relax into this beautiful living room. It is flanked on each side by large built-ins filled with our favorite Trove accessories. Dueling Claire sofas create symmetrical balance in this space, all pulled together by a colorful accent rug. We love how the designer layered the rugs to add texture and dimension. The concrete top and iron base of the Emily coffee table brings a rugged outdoor element into this family space. For this everyday living space, the designer chose practical, kid-friendly pieces without sacrificing style. The classic frame of the Mitchell sectional is sure to fit the whole family! A soothing champagne fabric and brass nailheads complement the neutral tones throughout the space. The playful design of the Miles club chair is a great option for a space like this, taking up minimal room but offering stylish seating. We love the idea of creating a little reading nook or a space for the kids to sprawl out with all their toys. Whether it's just one room or your whole home, we love finding refreshing ways to make every space feel new and inspiring. The simple addition of design elements like a soft neutral fabric or a fresh rug can do the trick. Stop by the store and let us help you find the perfect piece to refresh your space!